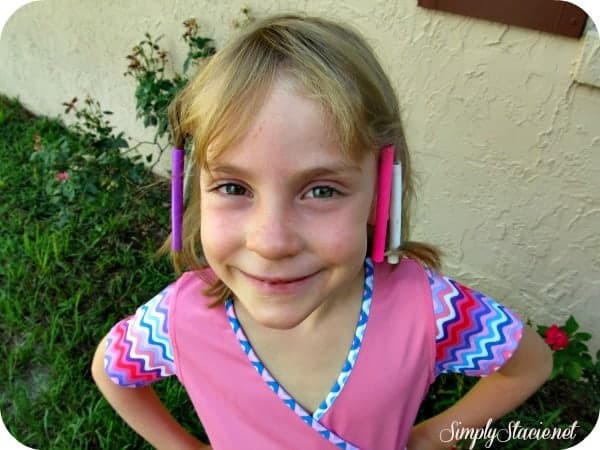 My daughter loves to wear hair accessories so she was excited to try HairThingz®. This creative hair accessory was surprisingly easy to use and I like that it doesn’t damage her fragile hair. These spiral shaped pieces can be stretched similar to a rope to wrap along the hair and you can even layer or link it together. Taking it out is easy too and there were no tears from my five year old because of tangles or knots. When HairThingz is removed it goes back to the original shape and can be used again and again. There are many different styling options to make accessorizing with HairThingz® for young girls fun and easier than ever. I like the Basic Wrap but there is also the Candy Cane and Simple V-Twist. There is a wide range of color sets to choose from including the Pretty Princess, SuperStar, Cupcake and Sunburst. Each set ($6) comes with twelve pieces and four colors to mix and match. My daughter loved wearing her HairThingz® in her hair and got lots of compliments from her friends at bible camp. It stayed in her hair for three hours without falling out which is a big plus since she has very fine hair and accessories usually fall out or get lost when she is on the go. You are invited to visit HairThingz® to shop for your favorite set……perfect for back-to-school! Connect with HairThingz® on Facebook and Twitter too.